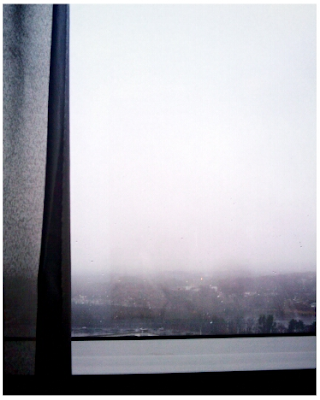 A gentle snowfall zig-zags against the glass of my 27th-floor hotel suite as I lay across a huge, neatly made bed. My gaze lands beyond the stripey interior of the room to focus on the slow-moving cars and sheer gradation of the natural Connecticut landscape. I watch the colors of a distant traffic light rhythmically change against the wet street below. The river appears calm, however I wonder how fast the water is moving. I think about it's surface splashing and chilling the rocks and river banks along its journey towards the ocean. I switch on my speakers to fill the air with Carissa's Wierd, one of my favorite Seattle bands. I feel an emotional swelling in my eyes...this view, this quiet hour alone, this song, this life I'm living...all coming together to make a single moment. A moment in time that is now a part of me. This view reminds me of the scene from the large picture window in the home I grew up in. It overlooked Lyder Vally, which is spotted with cows and swampy lakes that would appear after a grand rainfall. As a child, I remember thinking about where the water would go.